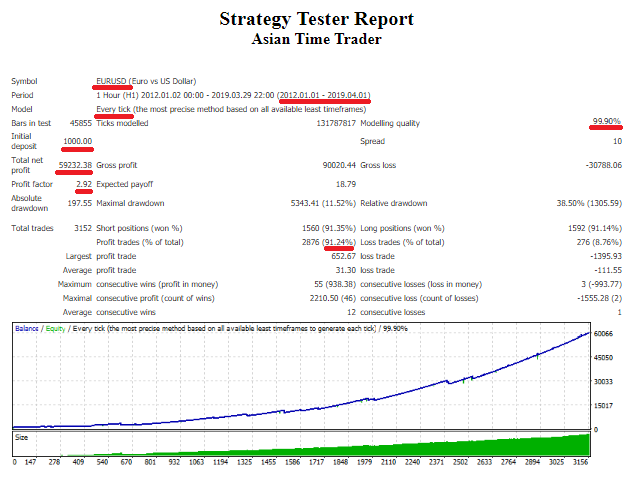 Asian Time Trader is a fully automated Scalper Trading System which trades on Asia markets only. Mean reversion system is used for basic entrance algorithm. Momentum and ATR are main indicators of system. The Expert was tested in 7 years of EURUSD historical real tick data. Please download it and test it yourself. Asian Time Trader aims to keep the trade results stable. Percentage of Free Margin (0-100): When Auto Lot is enabled and this value is 80, it means expert will use 80% of your balance for trading. This value must be between 0-100. Max Orders: It shows maximum orders on one direction at the same time. If it is 4, it means expert can open maksimum 4 buy and 4 sell orders at the same time.